Immunogen :Anti-Cyclin A Antibody was produced by repeated immunizations with a recombinant protein corresponding to the human cyclin A. 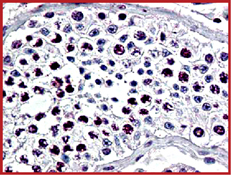 Sample Data :Immunohistochemistry using Rabbit Anti-Cyclin A antibody. Tissue:human testes tissue. Fixation: formalin fixed paraffin embedded.Antigen retrieval: not required.Primary antibody: Anti-Cyclin A at 1:500 for 1 hr at RT. Localization: Cyclin A is nuclear and cytoplasmic.Staining: Cyclin A as precipitated red signal with hematoxylin purple nuclear counterstain. 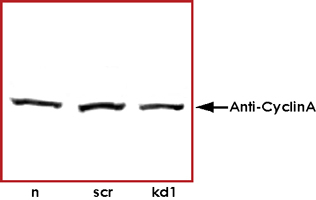 Sample Data :Western Blot of Rabbit Anti-Cyclin A antibody. Lane 1: T98G cells treated with normal (n). Lane 2: T98G cells treated with scrambled (scr).Lane 3: T98G cells treated with PIN1 knockdown (kd1).Load: 25 µg per lane. Primary antibody: Anti-Cyclin A at 1:400 for overnight at 4°C. Predicted/Observed size: 60kDa for Cyclin A. Scientific Background :Anti-Cyclin A detects cyclin a. Cyclin A is a member of the cyclin family. Cyclin A binds to S phase CDK2 and is required for the cell to progress through the S phase. CDK2/Cyclin A is inhibited by the complex p21CIP. The Anti-Cyclin-A antibody is ideal for investigators involved in cell signaling, cell biology and signal transduction research. References :1. Rizzolio F, Lucchetti C, et al, Retinoblastoma tumor-suppressor protein phosphorylation and inactivation depend on direct interaction with Pin1. Cell Death and Differentiation 1-10. Nature 2012.